This project is a tribute to the many years' dogged research conducted by the late Ronnie Waters who died in 2015, aged 91. Many generations of Waters have lived and worked in Southwold... mainly as fishermen, battling exhaustion, hazardous seas, unpredictable fortunes and, more often than not, grinding poverty. Thanks to his grandmother who put her foot down, Ronnie's father was the first Waters to take a shore trade - as a painter and decorator. Ronnie himself started his working life in the 1930s as a butcher's boy with the London Central Meat Company which had a branch in the High Street. Thanks to the patience and dedication of an enlightened manager he learned his trade quickly and well. After the War he returned to Southwold to work as a butcher first in Baggotts in Trinity Street and later at the Co-op Butcher in Station Road. By 1954 he was the Manager of Hutsons in the Market Place where he stayed for the next 34 years. In the meantime Ronnie was building a distinguished reputation in public life in what was at that time a fully fledged Borough, first as a Councillor and latterly as Chairman of the Council, and Chairman of the Policy and Finance Committee. In that capacity he helped to steer the town through the traumatic transition from Borough to Parish during the big shakeup of Local Government in 1974. 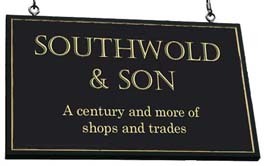 Always fascinated by local history and with a rich personal knowledge-base of Southwold trades, Ronnie decided in his retirement to devote himself to documenting the history of the town's commercial enterprises. Initially, the time parameters of the project were from 1900 to the turn of the Millennium but it soon became obvious that it was impossible to be strict about this. Often he found that the only way of making sense of the stories was to follow them back as far as they would take him. Ronnie completed most of his research in about 2005. The fact that it has not seen the light of day until recently has been mainly because of the difficulty in finding a way to present and publish it in a meaningful format. As a book it would be very bulky, expensive to print in small quantities and problematic to cross-reference. I approached Ronnie in 2009 and suggested a website. This is the result. Digital publication has proved to be an ideal solution. Not only is it a much cheaper medium than print, but it also lends itself brilliantly to cross-referencing, searching and indexing. Best of all, it lets the whole thing evolve on a daily basis as more data becomes available. Since Ronnie handed the project over to me, it has expanded greatly, partly through my own researches but very largely as the result of information and photographs contributed by visitors to the site from all over the world. There have been many hundreds of them, some Southwold-born, many descendants of Southwold tradespeople and many, too, who remember childhood holidays in the town. Ronnie, though he never touched a computer, was hugely supportive of this website which, apart from having become my personal obsession, is also a living monument to a very special Son of Southwold. Thank you to photographer Stephen Wolfenden for permitting us to use the images from his three Southwold books. John and Valerie Baker and Jonathan Hadgraft for introducing me to this fascinating aerial photo of the town in possibly the late 1940s. Jayne Barnett (nee Hyslop) - for information about No 59 and 71 High Street and No 10 Market Place and the businesses run by her parents, Michael and Joyce Hyslop. Robin Barr-Hamilton - for a photo of and information about his grandfather, Basil Douglas Barr-Hamilton and The Southwold Steam Laundry. Sylvia Barsby (nee Raffles)- for sharing her childhood memories of the 'Dutch Barn' restaurant and the 1953 floods. Also Sarah Groves of Adnams for permitting us to reproduce a letter from Sylvia's father, Major Raffles. 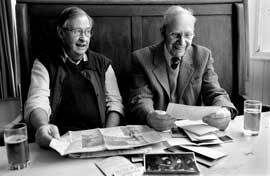 Jim Blythe - for information on the Blythe, Marshall and Crick families and for sharing the contents of his late father's news scrapbooks. Andrew Bootman - for providing memories, photograph and a descendency chart of the Carter family of Nos 14 - 18 Victoria Street. Laurette Burton - for information on the history of the Roman Catholic Church. Nigel Chapman for giving permission for us to reproduce the photo of his father,'Shrimp' making deliveries for the Manor Farm Dairy. Richard, Helen and Jenny Cook - for information and photographs relating to their family's ownership of businesses at Nos 5 and 8 East Street. Matthew Coward - for information on No 7 St James Green. Julie Dawson of Canada for a photograph of her watercolour of Black Mill. Marguerite Jill Day - for information on her Great Great Grandfather, George Juler and other members of this watchmaking family at No 82 High Street. Anne Dewar (nee Dunton) for information about the Osborne and Dunton families of No 5 East Street. Also to Richard, Helen and Jenny Cook for information and photographs relating to their years at the same address. Gary Doy - for photographs of his grandfather, Freddie Wells, and of Walter Rockall. Margaret Frost - for allowing us access to the unpublished memoir of her father, Cyril Steley and his account of life in Southwold in the early part of the 20th century. Lindsay Goward - for information about No 33 High Street. Alan Hatfield - of Leiston, for supplying details of the career of Thomas Edward Key (1864-1911), architect of the Station Hotel, Randolph Hotel and Southwold Hospital. Jane Haward - for giving us access to historic title deeds, indentures and documents relating to Baggott's Mill and the buildings subsequently erected on this site. Also Peggy Cannell for information on the Baggott family and .Nigel Bedingfield - Editor/ Director of icenipost.com for allowing us to reproduce the picture of Bolderston & Baggott's bread cart..
Danielle Knott - for information about her ancestor Eaton Moore and for allowing us to reproduce a portrait of him in her possession. David Lee - for information on No 21 High Street and also Elizabeth Morgan of New South Wales for information on and photographs of her great grandparents, Charlie and Ellen Goffin who were butchers at this address. Thanks also to John Goffin for permission to reproduce pictures from his collection. 'Kay' for allowing us to reproduce photos of Ernest Allen's Fire service medals in her possession. Martin - from Garden Gnome Software, for kindly volunteering to create our first 'virtual tour' from our panorama of the High Street / Victoria Street junction, at no charge. Maggie Mayne (nee Priday) - for information about Douglas House Wool Shop, No 12 Stradbroke Road, and her adoptive mother, Miss Joan Priday. Christine Miller - for the genealogy of the Debney family whose business occupied her home at No 7 South Green. Also..Heather Martin of Adelaide, South Australia - for information about her Debney ancestors. Diane Miller (nee Wyatt) for a price list of Chaplin & Carter of No 14 Stradbroke Road. Also for information about and photos of her time as a pupil of Roses Way School at No 26 North Parade. Philip and Arnold Pacey - for allowing us to publish part of the unpublished memoir of their mother, Mildred Button of Bradford House, Corporation Road. Also Revd Lesley Crawley for helping us to identify the location of Bradford House. Linda Rhodes - for photographing the exposed original shop sign for No 18 Queen Street. 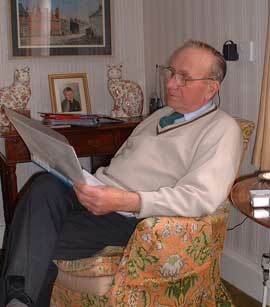 Bernard Segrave-Daly - for his research on the history of the inns of Southwold. Judith Simmons (nee Hurst) for help with various aspects of Southwold in the 1950s and 60s and for allowing us the freedom to 'mine' her book "Growing up in Southwold"
Katie Sullivan - for information on ownership of the Pier Avenue Hotel. Ann Thornton - for memories of her father and Grandfather, Barrett and Frederick Jenkins and for permitting us to reproduce many of the photographs in Barrett's books about Southwold. Steven Todd - for information on No 5 Chester Road. Anne Wolton - for information and photos of her parents, Harry & Neta Land of No 13 East Street, and grandfather, Ernest, who drove the delivery vehicle for Eastaugh's bakery at No 64 High Street. Steven Wells - for memories of his father and grandfather and their shoe repair business at No 50 Church Street. 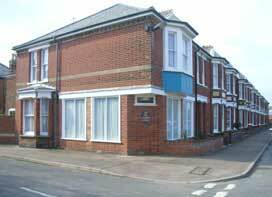 Mike Wilkinson - for details on the recent history of the Blyth Hotel.